Around here, we love merino clothing, and T-shirts are certainly a staple. Woolly Clothing Co. makes 100% merino T-shirts, henleys, etc. Their T-shirts come in two different weights (150 and 190 gsm) and the rest of the products come in one weight only. I have a Short Sleeve Crew Neck Tee, Short Sleeve Ultralight V-Neck Tee, and a Long Sleeve Henley. I’ve been wearing them for almost a year now and have certainly put them through their paces. The 150 gsm (what Woolly calls ultralight) and 190 gsm fabrics are quite different. The heavier fabric has shown more pilling (or maybe more aptly described as “it has become fuzzy with wear”). The ultralight fabric is certainly lighter, but is not what I would necessarily call ultralight. Both fabrics are soft and not scratchy/itchy. There is a definite difference in warmth between the two weights. On some warm summer days, the 190 gsm fabric was almost too warm. The 150 gsm fabric is perfect for year round wear and the 190 gsm fabric is great for a henley. These shirts fit me extremely well. They are fitted, but not too slim, and they are just the right length. I have had no issues with bacon neck and the button placket on the Long Sleeve Henley hasn’t become distorted. After I washed my Long Sleeve Henley the first time, I found a hole near the side seam. When I contacted customer service, they were very responsive and sent a replacement. I just recently discovered a similar hole in the same location on my Ultralight V-Neck (I’ve had the shirt for about a year). This time customer service suggested it might be moth damage. I have reservations about this as my closet has plenty of other tasty merino that has not shown any signs of moths. Since the hole occurred in the same place along the side seam on both shirts, I can envision a possible issue when the fabric was sewn. 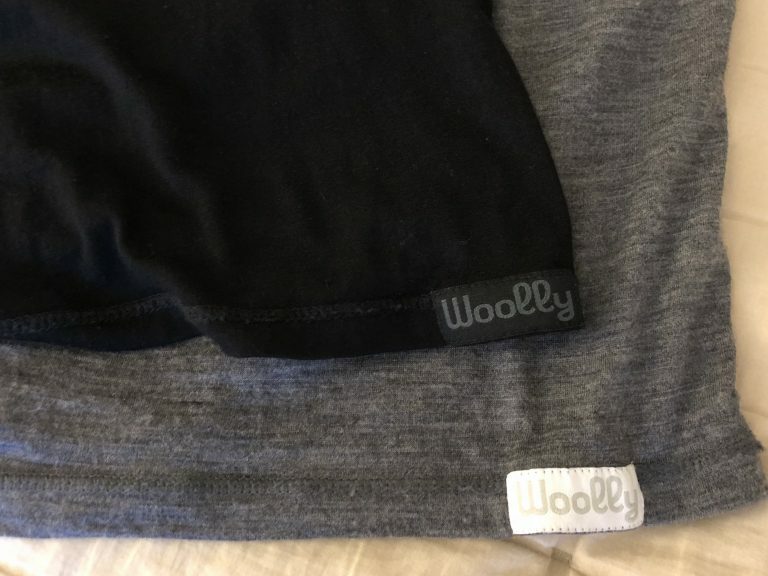 If you don’t care to advertise the brand of clothing you are wearing, Woolly puts a fairly large tag on the bottom hem of their shirts. The tag blends in with the black fabric much better than the charcoal. This is not a dealbreaker for me, but not my favorite thing either. 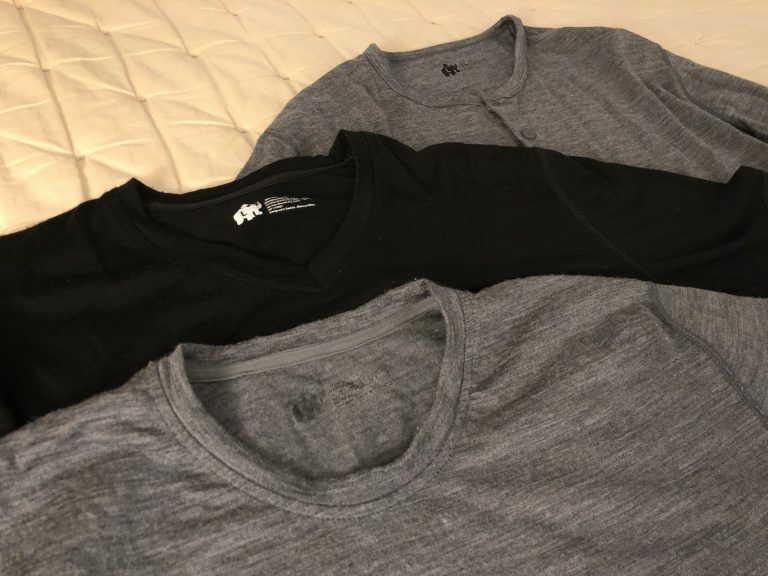 The Woolly shirts are not my favorite shirts, however, comparing the 100% merino shirt market (at full price), these shirts are certainly a good value. The fit is also great. Many times I run into shirts that are either too slim or boxy, but these are cut perfectly. My reservations for recommending these shirts are the “fuzziness” that develops and the issues I’ve had with holes.